In January, the Federal Highway Administration’s (FHWA) Long-Term Pavement Performance (LTPP) program launched its 2015 LTPP InfoPave™ Web portal at the annual Transportation Research Board (TRB) meeting in Washington, DC. Making its debut in January 2014, InfoPave provides improved access to LTPP data and other program information, such as findings from data analysis studies, extensive documentation for the many aspects of LTPP experimental designs, data acquisition, quality control, and data dissemination. 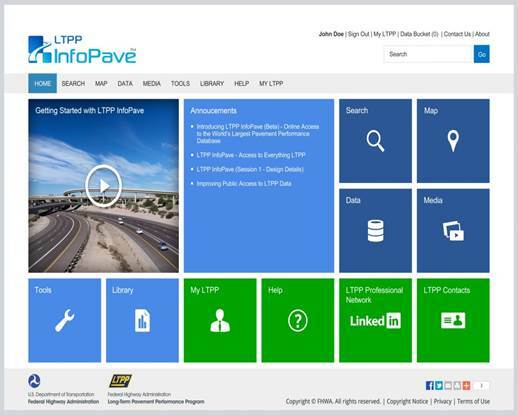 In 2014, the program formed an LTPP InfoPave Champions Group, which consists of representatives from highway agencies, academia, industry, and private sector research communities—stakeholders who will benefit the most from the Web-based system. The group provides stakeholder input on strategies to improve the InfoPave portal. Improved filters for identifying LTPP test sections of interest. Section timeline that includes major construction events and monitoring activities. Visualization of pavement layer properties and distress data over time. Access to the Canadian-LTPP (C-LTPP) data. Interactive LTPP Data Analysis Strategic Plan and research reports. Enhanced presentation of LTPP program documents, tools, and media. The LTPP program is committed to preserving the LTPP database and ancillary information collected for nearly three decades. Addressing the varied needs of data users in accessing program information easily is a priority for the program. For more information, contact Jane Jiang at jane.jiang@dot.gov or (202) 493-3149. The LTPP program initiated a new Specific Pavement Study (SPS) experiment to monitor the long-term performance of warm-mix technology. The SPS-10 experiment, “Warm-Mix Asphalt Overlay of Asphalt Pavements,” aims to compare the performance of warm-mix asphalt (WMA) to hot-mix asphalt (HMA). 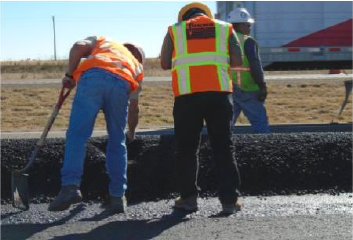 For the purpose of this study, WMA is defined as asphalt pavement produced at 30 degrees Fahrenheit below standard HMA production temperatures (below 275 degrees Fahrenheit). This new experiment will narrow the knowledge gap that currently exists between the performance of WMA and HMA pavements. 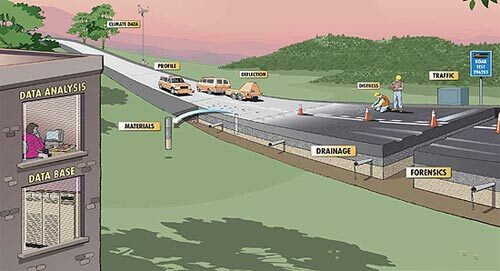 The SPS-10 experiment is designed to explore how a set of primary factors influence pavement performance. These factors include the WMA technology used, environmental elements (temperature and moisture), and traffic loadings. Each SPS-10 project will consist of the following three core test sections: HMA control; WMA produced using a foaming process; and WMA produced using a chemical additive. Similar to other LTPP SPS experiments, highway agencies can include supplemental test sections to perform additional research relative to their own needs. For example, a highway agency may decide to study the effects of increased recycled asphalt pavement content, decreased overlay thickness, or other WMA production methods. The materials sampling and testing as well as performance monitoring of supplement sections will be performed by the LTPP program at no expense to the highway agency, with resultant data stored in the LTPP database and available through LTPP InfoPave. Field crew measure the temperature of the dropped asphalt concrete for the New Mexico SPS-10 site. The New Mexico Department of Transportation constructed the first LTPP WMA project in November 2014 on Interstate 40, approximately 80 miles east of Albuquerque. The project includes three core test sections plus two supplemental sections. The supplemental sections will allow New Mexico to compare the performance of PG 70-22 + binder and the chemical additive, Cecabase®, to those used in the core sections, PG 70-22 binder and Evotherm®, the chemical additive. The Texas Department of Transportation constructed the second project for the new SPS-10 experiment in February 2015 on U.S. Route 277, approximately 60 miles southwest of Wichita Falls. The project includes three core test sections. The State did not build any supplemental sections. Belly-Dump Haul Truck used at the Texas SPS-10 test site. Data collection has started for these two projects and is being added to the LTPP database. The LTPP program held a Webinar in March to present the construction and data collection activities for these two new test sites. The recorded Webinar can be viewed by clicking this link: New Mexico and Texas First to Build New SPS-10 Test Sections. Official recruitment for the experiment began in January 2014 and the LTPP program is still receiving nomination packages from States and Provinces to fill the experimental matrix, which calls for a minimum of 16 projects. However, the program has not received many nominations for sites in the wet-freeze environmental region. Test sites are needed in these locations to achieve the full benefit of this experiment. States and Provinces in wet-freeze geographical areas are encouraged to look at their construction projects and identify possible candidates. 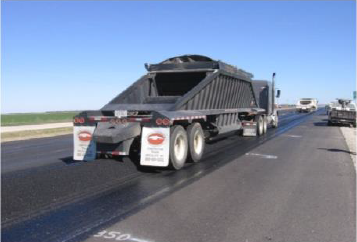 For more information about the WMA experiment and how your highway agency can partner with the LTPP program in evaluating the long-term performance of these new paving materials in real environments and under real traffic loads, contact Jack Springer at jack.springer@dot.gov or (202) 493-3144. Each year at the annual TRB meeting, the LTPP program holds sessions to discuss program activities and present findings from analysis studies that are of interest to the pavement community. The Data Analysis Working Group (DAWG) Forum on Pavement Performance Data Analysis (held January 10, 2015), consisted of 13 presentations, including 2 briefings of winning papers in the 2014 International Data Analysis Contest, managed by LTPP and the Transportation and Development Institute (T&DI) at the American Society of Civil Engineers (ASCE). The LTPP State Coordinator’s Meeting (held January 11, 2015) featured opening remarks by Walter “Butch” Waidelich and Frederick “Bud” Wright. The audience also had the privilege of hearing from Neil Hawks and Paul Teng, two of LTPP’s past program managers who participated in a roundtable discussion with Aramis López, the current LTPP program manager. Each offered insights and perspectives in managing a large, long-term research program. The discussion was followed by presentations by Tom Baker, Said Kass, and Larry Scofield, who discussed the importance of continued partnerships with States and Provinces and collaboration at the international and industry levels. Long-Term Pavement Performance Data Analysis Findings and New Features in LTPP InfoPave™ was the theme of the LTPP technical session (held January 12, 2015). Leslie Titus-Glover and Harold Von Quintus presented results from, “Findings from the SPS-8 Projects after 15 Years in Service” and the “Backcalculation of LTPP Deflection Data: Procedures and Results,” respectively. These two topics drew a full room of attendees. In addition, Riaz Ahmad highlighted the new features that were added to InfoPave since its initial launch in January 2014. There was also an InfoPave poster session that allowed for one-on-one discussions. Stakeholders learned about the Web portal and how users can access information they need from the LTPP database. For the past several years, ASCE and the LTPP program have been partners in the ASCE-LTPP International Data Analysis Contest. This year, both partners were pleased to receive very good papers from students, and were delighted to make a first place award in two of the three contest categories. Holly Faubert, on behalf of the student team, and Changwei Xu receive the 2014 Data Analysis Contest Award. The award presentation was made by T&DI President Brian McKeehan and T&DI Director Muhammad Amer. Changwei Xu from the University of Cambridge won first place in the graduate category for “Analysis of Cracking in Jointed Plain Concrete Pavements.” Student team members, Patricia Hogan, Nelson Shepard, and Holly Faubert, won first place in the partnership category for “Determining the Effect of Climate on Cracking and Roughness of Asphalt Pavement Using InfoPave.” The team is from the University of Rhode Island and worked with the Rhode Island Department of Transportation. 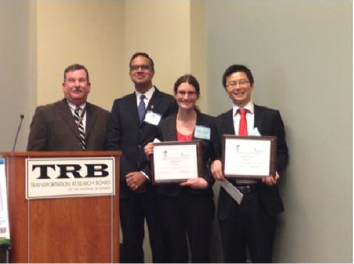 The winners attended TRB’s annual meeting and presented their work at the DAWG meeting. They were also recognized at the LTPP State Coordinators’ meeting for their accomplishment. The 2015 contest is well underway and papers are due July 17, 2015. Contest guidelines for next year are being developed and will be available at the beginning of the 2015-2016 academic year. To access these guidelines, please visit LTPP’s Web site later this summer. The TRB LTPP Committee’s leadership and support in sponsoring the sessions during TRB week is greatly appreciated. 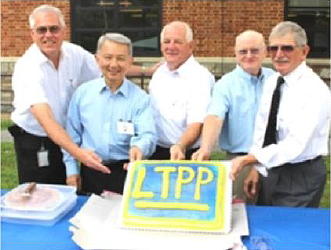 The LTPP program would also like to express gratitude to William “Bill” Temple (former Chair), Ralph Haas, and Michael “Mike” Ayers, who have retired from the committee. They have been long-time supporters of the program (in fact, Ralph took part in developing the LTPP program in the 1980s). Their professional contributions and personal interactions will be missed. 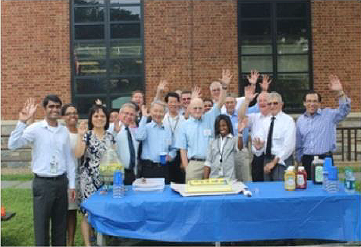 Former LTPP program managers—Neil Hawks (who retired from TRB) and Paul Teng, Charlie Churilla, and Monte Symons (who all retired from FHWA)—and Aramis López (LTPP Team Leader) met at the Turner-Fairbank Highway Research Center to have individual photos and a group photo taken for the document titled, “The Long-Term Pavement Performance Program.” This document, which will be published this summer, chronicles the LTPP program from its inception and outlines plans for the future. Mr. López gave the former LTPP program managers a tour of the LTPP server room and talked about the commitment FHWA has made to preserve the database. Even though they have not been actively involved with the LTPP program for years, the former leaders remain interested in the success of the program and were very pleased to hear about the agency’s commitment to its future. It has been years since the leaders were in each other’s company, so this was a very special gathering for everyone. Following the photo shoot, the LTPP Team members gathered with guests on the grounds of Turner-Fairbank Highway Research Center. 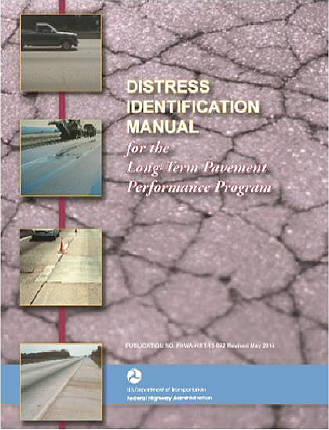 The Distress Identification Manual for the Long-Term Pavement Performance Studies was first developed in 1987. Since then, it has undergone four revisions, incorporating refinements, changes, and LTPP program directives that have been implemented over the years. The fifth and latest version was published in May 2014 (Publication Number: FHWA-HRT-13-092), and is the result of many years of practical experience using previous versions. The Distress Identification Manual (DIM) is available online at www.fhwa.dot.gov/publications/research/infrastructure/pavements/ltpp/13092/index.cfm. To request a hard copy, contact LTPP’s Customer Support Service Center at ltppinfo@fhwa.dot.gov or FHWA’s Report Center at report.center@dot.gov. In 2014, the LTPP program lost a very dear colleague and friend, Mary Anne Denney. 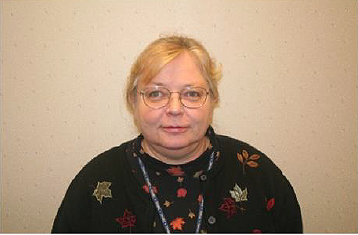 Mary Anne was a technician and publication coordinator for the program for 18 years. Most recipients of this newsletter did not know Mary-Anne, and the work she did was seldom “front page news,” but she performed many critical duties that impacted the LTPP team quite significantly. Mary Anne was a core member of the LTPP team. She was the person behind all of the program’s communications activities. She took care of the editing, publication, printing, distribution, and storage of all our program documents. She was the first to draft the newsletter for the team and had the responsibility of finalizing and sending it out to the world to read. When called upon to help, Mary Anne gladly took the lead in organizing the LTPP program publications, which later resulted in the LTPP Reference Library. She not only developed the reference library, which contains over 2,000 publications, she also maintained it and added new LTPP publications when needed. In meetings, Mary Anne was the one to step back and ask the simple, but very profound questions, such as why we were doing things a certain way. Being the non-engineer in the group, she helped us see things from a different perspective. Her attention to detail and the quick turnaround she provided to our team was always of the highest quality. In 2014, Jamie Harris joined the LTPP team to perform program communications activities including editing, publication, printing, distribution, and storage of all program documents. Jamie is very knowledgeable about the LTPP program and has already been instrumental in helping us communicate with our partners once again. Please join us in welcoming Jamie as the new technician and publication coordinator for the LTPP program. Jamie can be reached at jamie.e.harris.ctr@dot.gov or (202) 493-3463. LTPP 2014 and Beyond - What Is Needed and What Can Be Done?